Selecting gear for a long walk always means looking at likely conditions and also possible extremes. The High Sierra has a very benign climate when compared say to the Scottish Highlands but in autumn there are sub-zero nights and a possibility of the first snowfall. In the desert temperatures should be cooler than in summer though still hot for anyone from Britain. Strong winds are a common feature of desert nights. This all meant that I needed gear that could deal with both freezing and very hot weather plus strong winds and maybe snow. Rain was very unlikely. In fact during the walk it snowed on one day and never rained (though it poured down during the car journey from Death Valley to Las Vegas!). Of the twenty-six nights I camped the temperature dropped below zero on ten with the lowest being -7.5°C. On only two nights were the lows above 10°C, both at low level camps in the desert. 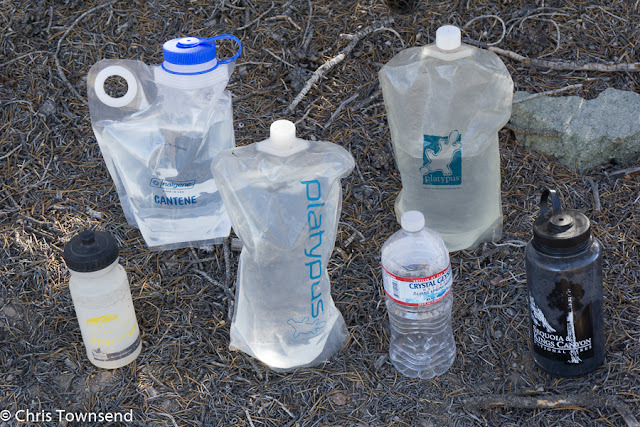 Whilst my equipment was not very bulky or heavy I knew that I would need to carry six days food at times in the High Sierra and that this would have to be in a big and weighty bear-resistant container (these are mandatory in Yosemite National Park and some other areas). I also knew that in the desert I would have to carry ten plus litres of water. I needed a pack that would handle the weight and into which a bear-resistant container could easily be packed. The 1.4kg ULA Catalyst fitted the bill, being a bit roomier (72 litres including pockets) and more supportive than most lightweight packs, and wide enough at the top for the bear container to fit across it. The Catalyst proved comfortable and stable and a good choice. I only weighed the full pack once and it came to 15kg with the bear-resistant container and three days food. Having learnt on past trips that having two sets of footwear was wise I took trail shoes and sandals. I ended up wearing the latter – Teva Terra-Float Universal – most of the time and was very impressed with how tough they proved given that they only weigh 462 grams. After around 350 miles of rugged terrain with a full pack they are still in good condition. They proved very comfortable too with superb cushioning. 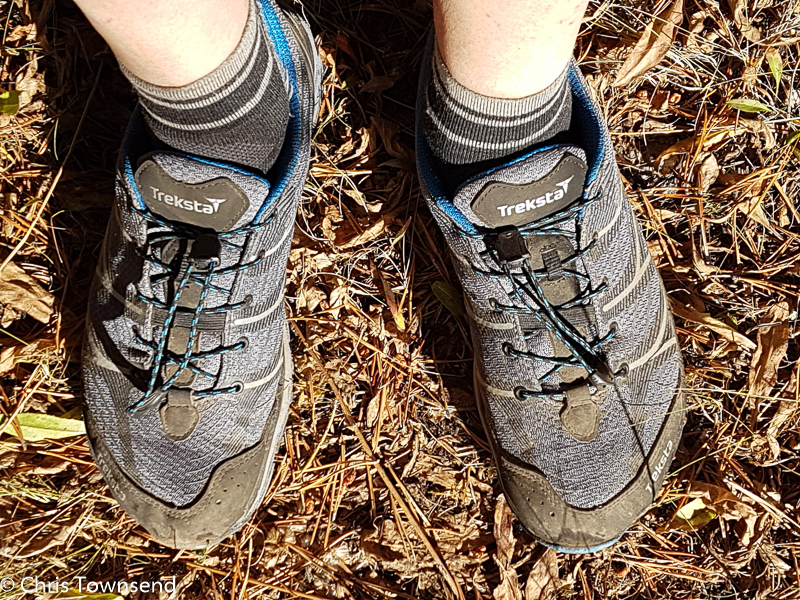 The Treksta Mega Wave shoes proved just as comfortable and were also very light at 628 grams. They are now rather battered-looking however. To be fair the company did say they weren’t designed for long distance backpacking and I did wear them on the very roughest terrain including the rocky ascent of Mount Whitney and the 2750+ metre cross-country descent from Telescope Peak, the first 600 metres of which were down steep loose scree and rocks, terrain that could make a mess of any lightweight footwear. 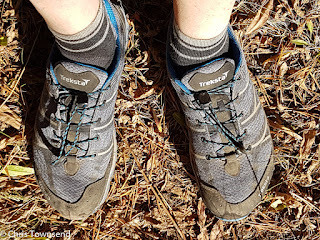 In the shoes and in camp I wore ultralight Teko Merino Trail Walking socks. These weren’t new and proved both durable and surprisingly warm. I also had some medium weight wool socks but didn’t need them as I had down socks for camp wear – I could get the sandals on over the latter. As on every backpacking trip for many years I used Carbon Fibre Pacerpoles (535 grams) and as on the Pacific Northwest Trail and the Scottish Watershed these also doubled as poles for my shelter and to turn my pack into a backrest. I can’t imagine a long walk without them. 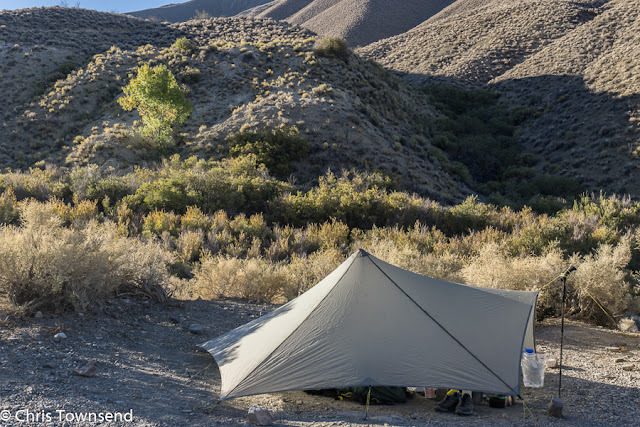 Although I hoped to sleep under the stars most nights I knew that I’d probably need a roof on windy nights and if it snowed or rained so I took a well-proven favourite, the 482 gram Mountain Laurel Designs Trailstar. 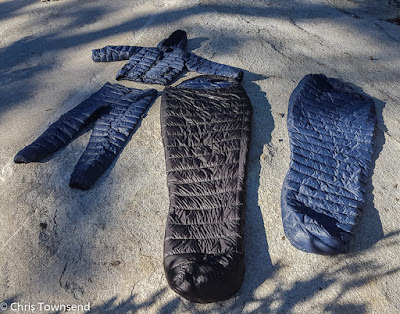 I ended up using this on eight nights in the wilds when it was breezy – though it was only really needed on two when the wind was very strong – and on five nights for privacy on campgrounds. I also used a Luxe Tyvek groundsheet that weighed just 142 grams and had the advantage of not being slippery like silnylon and the disadvantage of showing the dirt as it’s white. A bag of assorted pegs weighed 177 grams, giving a total weight of 801 grams for a roomy shelter with a spacious groundsheet. 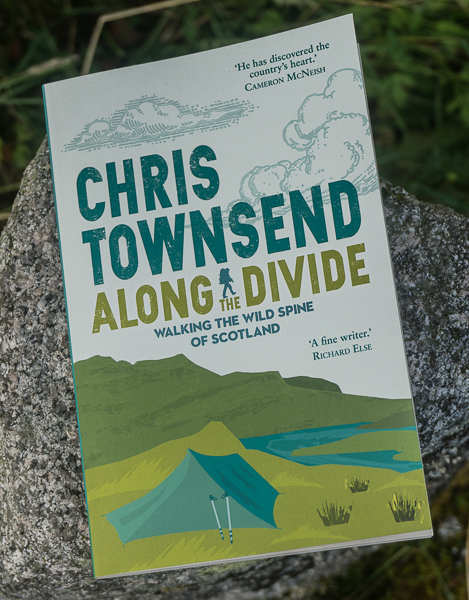 Until this walk I’d always preferred a sleeping bag warm enough for the coldest likely temperatures and mostly slept in little or no clothing. However, having tried the PHD Sleep System earlier in the year I was impressed and decided the lightest version would be ideal for this trip. It consisted of the 328 gram Ultra K sleeping bag, the 240 gram K Filler bag, 246 gram Wafer jacket with hood, 151 gram Wafer K trousers and 50 gram Wafer K socks, all filled with 1000 fill power down. The Ultra K bag is rated to +8°C so as most nights were colder than that I also slept in either the Filler bag or the clothing. I never needed both, even at -7.5°C. I found the system really comfortable and thought of the clothing as my down pyjamas. In the High Sierra where my kitchen was sited away from my bed in case of visiting bears the clothing was great to wear on chilly mornings and evenings. For ground insulation I took the 230 gram Therm-A-Rest NeoAir XLite S airbed and the 135 gram OMM DuoMat that I’d used on many previous trips including the Scottish Watershed. After a week of sub-zero temperatures in early October I wasn’t convinced that these mats would keep me warm enough if it got even colder so I bought a cheap, thick and bulky full-length foam pad. It weighed around 400 grams. After I bought it there were no more freezing temperatures! However it proved useful in the desert for protecting the NeoAir pad from sharp thorns and stones which I think would have penetrated the groundsheet. 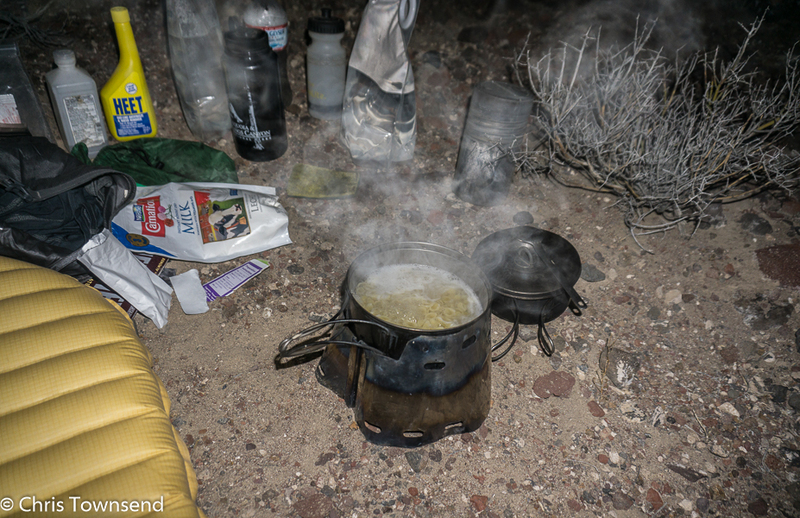 For cooking I took the same tried and trusted system that I’d used on the Pacific Northwest Trail, the Scottish Watershed and many other walks, namely the Trail Designs Classic Ti-Tri plus Inferno insert and my 25 year old Evernew and MSR 0.9 and 0.7 litre pots. Together with two spoons the total weight was 476 grams. 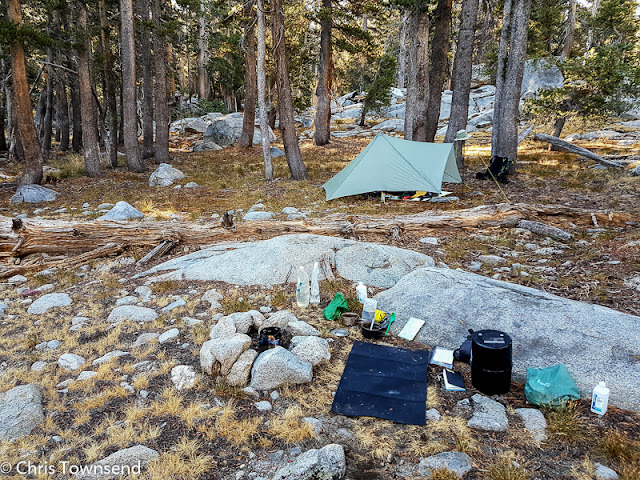 In the High Sierra I mostly cooked on wood as I usually camped in the forest. Having a mini camp fire when it was cold was very welcome. For above timberline camps and in the desert I used denatured alcohol in the tiny burner. In the High Sierra food was carried in a 1.27kg 10 litre Garcia Machine Backpacker’s Cache bear-resistant canister that I rented in Yosemite Valley. I could just cram six days food inside. It was convenient in camp but I was very glad to send it back from Lone Pine as it wasn’t required for the desert section. For water I had an old 79 gram 700ml GoLite bottle that did during the day and two 2 litre Platypus bottles that weighed 120 grams for camp. For the desert I added extra bottles as I needed to carry 10+ litres. My basic clothing every day was my T3 Tilley Hat (156 grams), a pair of Mammut Explorer shorts (65 grams) and a Paramo Katmai Light shirt (207 grams). 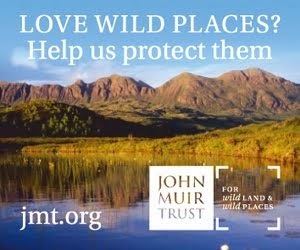 Both the hat and the shirt were old favourites that I’d worn on the Pacific Northwest Trail and the Scottish Watershed. The shirt is very comfortable in the heat and surprisingly effective as a base layer under other garments in cold weather. The big pockets held maps and phone. If it was chilly I also wore an Arc’teryx Squamish windproof jacket (168 grams) or, if I needed more insulation, the Berghaus Vapour Light Hypertherm Hoody (224 grams). I could probably have managed without the Squamish. The Hypertherm Hoody was essential. It replaced a fleece and had the advantage of being windproof. It was also very breathable and very comfortable and I walked in it in the coldest weather. In camp I wore it under the down jacket when it was below freezing. For camp and days when it was too chilly for shorts I had Salomon Wayfayrer trousers (292 grams). I also took a Rab MeCo long-sleeved base layer top and Montane Primino long johns. I didn’t need either but might have done if the weather had been colder. As it was I wore them in resorts when my shorts and shirt were being washed, as I did the old GoLite Reed overtrousers (110 grams) I took in case of rain. On the one day of snow the Salomon trousers and Arc’teryx windproof were adequate so I didn’t need the Berghaus Hyper waterproof jacket I carried. At 106 grams and rolling into a tiny bundle it didn’t add much to my load anyway. I did wear it once – when I went out for a meal in Las Vegas after the walk as it was raining! In camp and on cold days I wore a Smartwool Cuffed Beanie (53 grams) that was also a veteran of the Pacific Northwest Trail and the Scottish Watershed. It’s lasted really well and is comfortable on its own and under a hood. I had Bridgedale Primaloft Lite gloves too but rarely wore them. I had paper maps (well, waterproof plastic actually, digital maps on my Samsung Galaxy S7 smartphone courtesy of ViewRanger and a Silva Ranger compass. In the High Sierra where I was on trails most of the time I mostly used the excellent Tom Harrison Trail Maps, which fitted neatly into a shirt pocket, occasionally glancing at ViewRanger to see exactly where I was on sections of trail in dense forests. 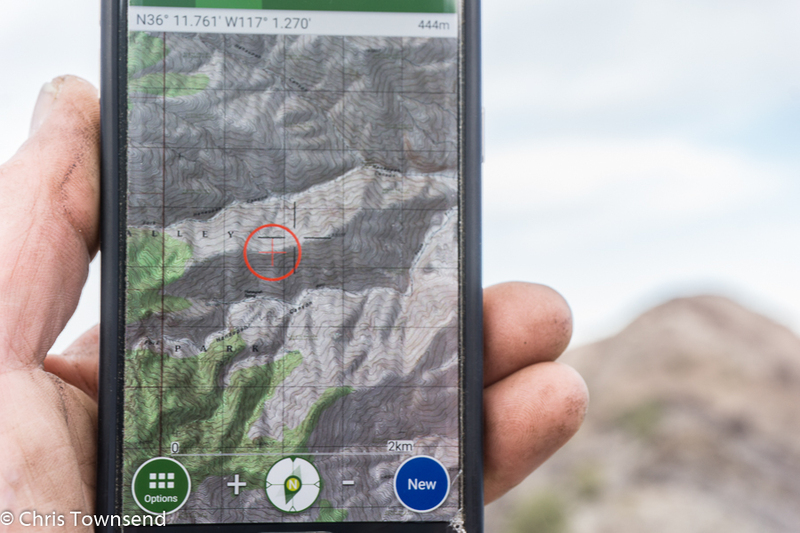 This changed completely in the desert section where I was often going cross-country and any trails were unsigned and often faint. Here I used ViewRanger frequently. I often needed a rough compass bearing too. For this I found the digital compass on my Suunto Ambit watch was adequate. The Silva compass was never used. Autumn days being quite short I often walked into the night, making my Petzl Tikka XP headlamp essential. I also had a tiny Petzl e+Lite headlamp as backup. This was useful when I needed to change the batteries in the Tikka in the dark. A big success on the walk was the Powertraveller Extreme solar panel and 4000 mAh power pack (600 grams). 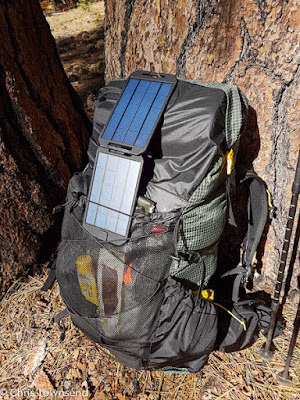 I hung the solar panel on the back of my pack and most days it fully charged the power pack which I then used to charge my smartphone and occasionally my watch, Kindle Paperwhite e-reader and camera batteries. I never ran out of power. Of course it was sunny almost every day. Other items were a Fox 40 emergency whistle, a SPOT GPS Messenger that I used to send OK messages most days, notebook and pens, reading glasses, Salomon Fury dark glasses (32 grams) that I wore every day, a first aid and repair kit, sunscreen, and an assortment of waterproof stuffsacks and Aloksak bags. 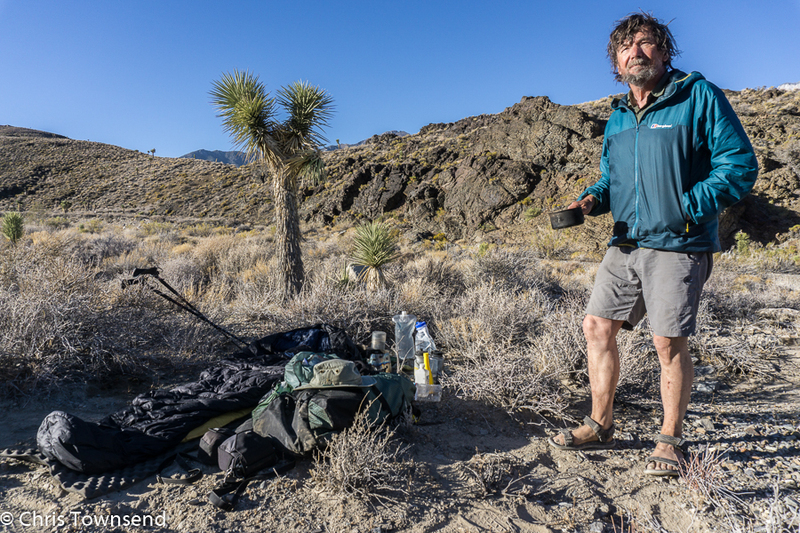 One particularly successful item was the Matador Freerain 24 pack, which I’ve reviewed in my Gear Editor’s Column on The Great Outdoors website. This 149 gram pack has sealed seams and a roll top and doubled as a travel bag for air travel, a shopping bag, and a stuffsack for my down gear. 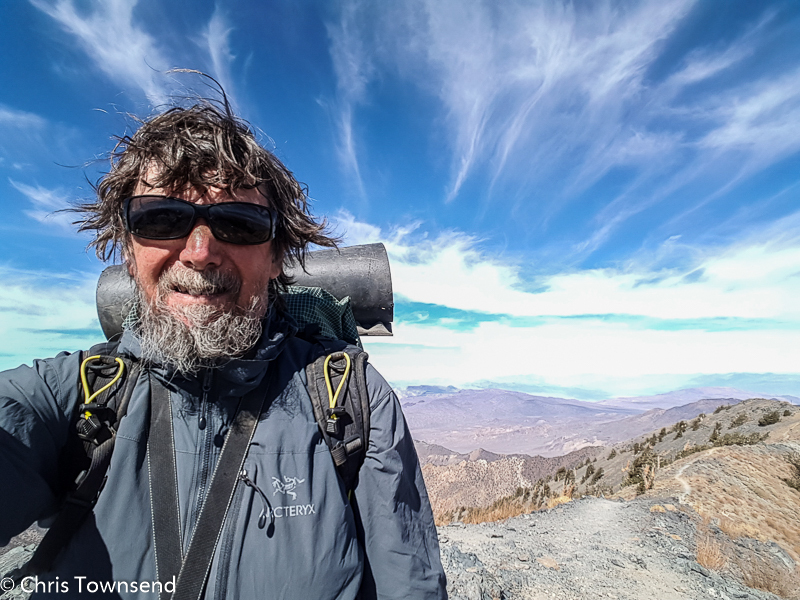 My cameras were the Sony a6000 and NEX 7 with Sony 16-50 and 10-18mm lenses, plus my smartphone, which was used for images I uploaded to social media and sent to The Great Outdoors website. With ThinkTank Mirrorless Mover cases my camera gear weighed 1.75kg. I posted a set of camp site pictures from the walk back in November and a piece on food for the trip in December. Chris, using a shelter - as opposed to being zipped into a tent with sewn-in groundsheet - how do you go about deterring unwanted intruders? I'm thinking of small mammals (or larger ones!) and reptiles, rather than human visitors. 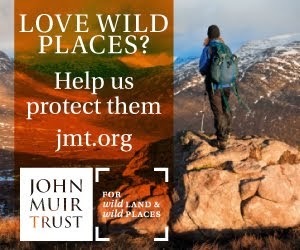 We're used to living in a country where there's nothing in the wilds likely to deliver a fatal or debilitating bite. There wasn't any danger from small animals. I didn't do anything to deter them. I live in Arizona and I use only a tarp and a down bag for winter and there is nothing that will really bother you during the nite when the temperature drops . I've only ever had one scorpion get in my sleeping bag during the warmer months and snakes don't bother you . Although... I did have a snake under my ground sheet once . That admittedlywas kinda scarry. How do you set up Pacer poles and backpack to make a back rest? I worry about breaking them. I wedge the handles in the back of the pack and push the tips into the ground with the poles angled away from each other. I've never worried about the poles breaking. The system does collapse occasionally! 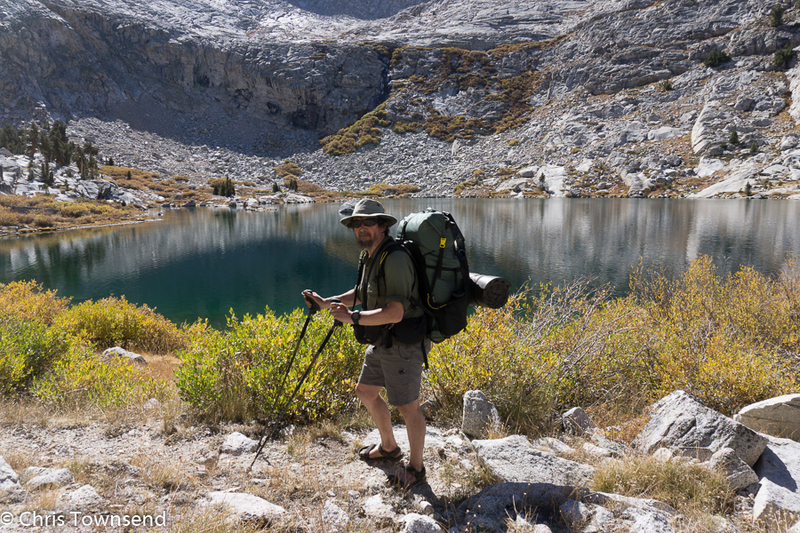 Hi Chris, this brought back great memories of hiking the JMT a few years back. I have question about using the solar charger to charge the camera batteries, basically does your camera take a USB input or do you have some other way? I've struggled to find a (light) way to charge my Canon G12 that only has an external battery charger. Thanks for any suggestions. Hi Susie, my current camera has a USB connection.With previous cameras without USB I just carried spare batteries. I'm afraid I don't know of any way to charge a camera without USB input from a solar charger. Susie, if the G12 has a removable battery, there are cheap camera specific chargers that charge the battery externally, with USB input. Try EBay , they are about £7. Usually very light too.